A massive nor'easter blizzard blanketed much of the East Coast in the heaviest snow seen in years, shutting down Washington, Baltimore and New York City, which as of Saturday even had been hit by the third heaviest snowfall in its history. New York City roadways closed at 2:30 p.m. Saturday, Gov. Andrew Cuomo announced, as heavy snowfall and winds crippled the nation's largest city. As of early Sunday morning, Central Park had 26.8 inches of snow. 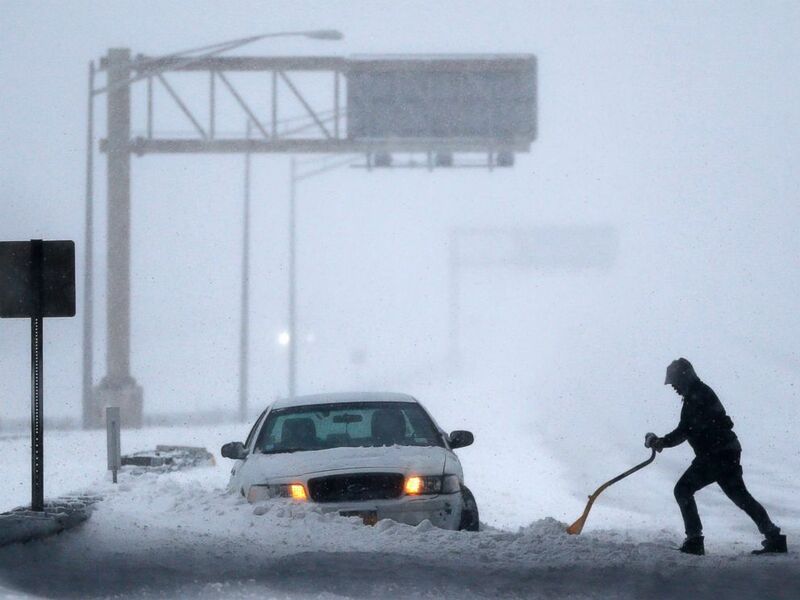 PHOTO:A motorist shovels snow to free up a vehicle on the New Jersey Turnpike during a snowstorm, Jan. 23, 2016, in Port Reading, N.J. There were 15 storm-related deaths as of Saturday evening: five in New York, three each in North Carolina and Virginia, one in Kentucky, one in Alabama, one in Pennsylvania and one in Maryland. Maryland, Virginia, Delaware, Pennsylvania, North Carolina, West Virginia, Tennessee, Kentucky, New Jersey and the District of Columbia have issued state of emergencies. New York Gov. Cuomo said Saturday he issued a state of emergency in New York City, Nassau, Suffolk, Westchester, Putnam, Rockland and Orange counties. In New York City, the Metropolitan Transportation Authority suspended bus service at noon Saturday. New York City and Long Islands roadways were to be closed Saturday at 2:30 p.m. New York City's outdoor subways will close at 4 p.m. Saturday. In Washington D.C. where the storm lingered for longer than expected Mayor Muriel Bowser and D.C. Homeland Security and Emergency Management Agency (HSEMA)Chris Geldart told reporters they weren't sure that schools or businesses would be able to open as the blizzard continued to hit the capital. Although the storm was expected to have lightened Saturday afternoon, Bowser said the storm was much stronger than expected in the afternoon hours. Maryland Governor Larry Hogan closed down I-70 and I-270 so that plows could clear streets. “As the state continues to fiercely fight Snow Storm Jonas, I want the citizens of Maryland to know that the state is taking every step necessary to ensure their safety,” said Hogan. “I am urging all Marylanders to stay off every road in the state, whether it’s the interstate or a local road. Stay safe and stay at home while crews do their jobs. The governor's announcement came hours after Baltimore Mayor Stephanie Rawlings-Blake banned non-emergency vehicles from the city streets. Inspite of warnings by government officials to stay inside, many people braved the snow for fun or work. In New York a few thrill seekers turned the staircase at the famous Bethesda fountain in to an impromtu ski slope. In Washington D.C. children turned the capital into a playground by sledding down Capitol Hill. Even a few animals in the National Zoo spent some time braving the snow and wind. Washington, D.C. and New York City: fewer than 5 each. The Pennsylvania Turnpike was closed for 86 miles due to the severe weather. Pennsylvania Gov. Tom Wolf estimated about 500 vehicles, including buses, trucks and cars, were stranded. The Pennsylvania National Guard, state police and local firefighters are helping Turnpike teams get the stranded drivers on their way. North Carolina had about 1,274 reported traffic collisions, according to the state's highway patrol. The Virginia State Police responded to 989 traffic crashes and 793 disabled vehicles on Friday alone. Airlines have cancelled over 10,000 flights for Friday, Saturday and Sunday, according to FlightAware.com. Philadelphia International Airport has cancelled all flights for Saturday while Charlotte Douglas International Airport in North Carolina is running with limited operations. The Baltimore Office of Emergency Management said late Friday that all flight operations at Baltimore–Washington International Airport were stopped due to the inclement weather. D.C.’s Reagan National and Dulles International Airports are expected to remain closed through Sunday, the Metropolitan Washington Airports Authority said Saturday. Delta Airlines said Saturday that it is planning to restart flying Sunday at noon at D.C. and New York airports, pending weather and road conditions. "A similar operational restart plan is in place for much of the rest of the region," Delta said in a statement. United Airlines said in a statement Saturday it "plans to start very limited operations on Sunday afternoon" at Newark Airport and other New York City area airports. At D.C. area airports, United will not operate Saturday or Sunday, but expects to gradually resume service there Monday. ABC News' Max Golembo, Dan Peck, Margaret Chadbourn and Matthew Foster contributed to this report.